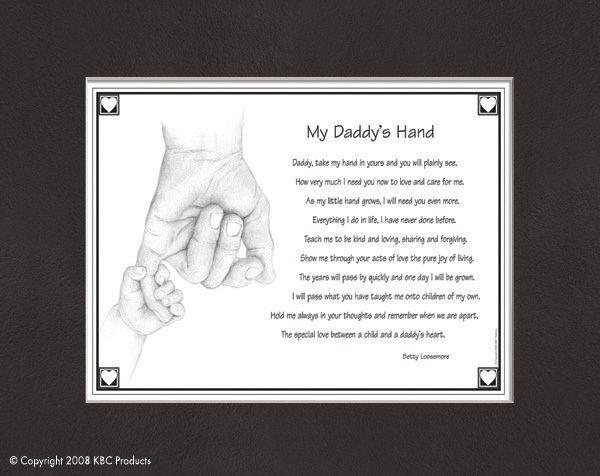 KBC Products - Quality Keepsakes and Heirlooms for Any Occasion. Wholesale and Retail Customers Welcome! Our unique wedding gifts and accessories will add elegance and charm to any wedding. From garters to handkerchiefs, medallions to good luck satchels, pillows to Pretty Petals, gifts for flower girls, ring bearers, mothers and fathers, our quality gifts and accessories become keepsakes and heirlooms to pass on to other generations. They are Precious and Priceless Keepsakes. Each gift includes beautiful sentimental poetry. Whether a gift for the bride and groom, attendants or parents, our gifts and heart touching poetry will leave a lasting impression on such an important day. Enjoy browsing through our wedding gifts. For a sharper picture, click on the picture for a larger view. Questions or to hear any of the poetry, please call us at 1-800-768-2197. Share the excitement and joy when announcing a pregnancy with A Hankie For Mom or A Hankie For Dad. Chances are they will need to use their handkerchiefs right away. Our precious Italian sterling silver Mommy-To-Be-Necklaces make a wonderful gift for the expectant mommy. Our 8 x 10 matted and framed God's Miracle print will be enjoyed while waiting for baby to arrive and makes a nice picture to hang in baby's room. For a sharper picture, click on the picture for a larger view. If you would like to hear the poetry, please call us at 1-800-768-2197. Our precious baby keepsakes are hard to pass by. 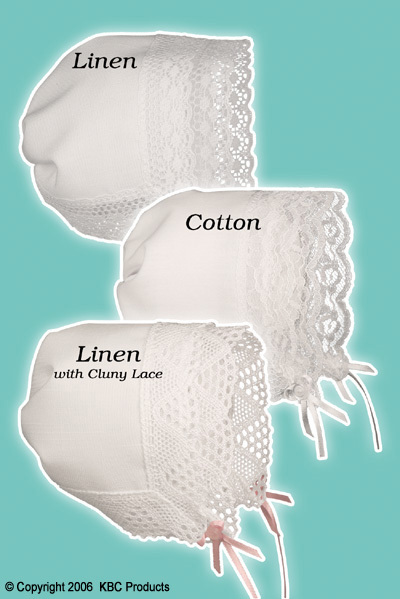 The Keepsake Bonnet remains one of our most popular gifts. Three popular Bibles for baby include the Keepsake Bible, the Keepsake Baptismal Bible and My Keepsake Bible. My Keepsake Bible plays "Jesus Loves Me". "Twinkle, Twinkle Little Star" plays in The Keepsake Tooth Fairy Pillow. Other gifts include Guardian Angels, Baby's Keepsake Bags, Baby's Keepsake Fork and Spoon and our very special Church Babies. For a sharper picture, click on the picture for a larger view. If you would like to hear the poetry, please call us at 1-800-768-2197. Many of our infant gifts are also appropriate for children and visa versa. 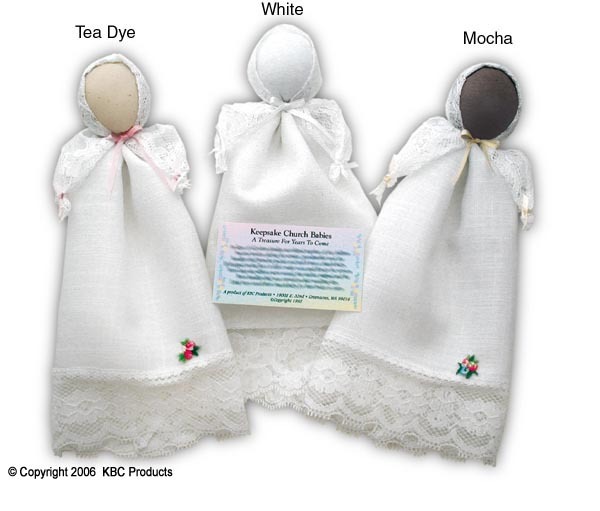 Church Babies are a perfect gift for children who have grown past the Baby Bonnet size. In days of old when families worshiped together, if the children became restless, grandmother took the handkerchief from her pocket and tied it into a Church Baby. If dropped on the floor it did not make noise and disrupt the sermon. Later, the baby is tucked away and on the wedding day the stitches are removed and the handkerchief is carried by the bride. Any one of our five Bibles are appropriate for most children. For a sharper picture, click on the picture for a larger view. If you would like to hear the poetry, please call us at 1-800-768-2197. Our Bibles are a pocket size King James New Testament, Psalms and Proverbs or the New Catholic Edition New Testament. Choose from our musical My Keepsake Bible to our elegant Wedding Bibles. We also offer Baptism, Confirmation and Communion Bibles. The Keepsake Bible, is a sweet baby gift that will later be used as a wedding Bible. Each Bible is accompanied by sentimental poetry. Our Bibles are beautiful keepsakes that are truly "Tomorrow's Treasures Today." For a sharper picture, click on the picture for a larger view. If you would like to hear the poetry, please call us at 1-800-768-2197. These very special keepsakes are minted exclusivley for KBC Products. This is such a unique and personal gift. Our mediallions are larger than a quarter, smaller than a fifty cent piece and just as professional as our U.S.minted coins. The back of the medallion has a decorative border around the outer edge with the interior of the medallion left blank for engraving, We have a variety of medallions for a wide range of occasions. Visit the site for details. For a sharper picture, click on the picture for a larger view. If you would like to hear the poetry, please call us at 1-800-768-2197. Our sterling silver jewelry makes a thoughtful gift for women of all ages and children, appropriate for a variety of occasions. We have two pewter pieces that include a whimsical Noah's Ark Pin and Angel Wings. 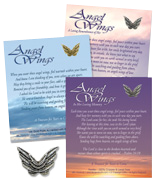 The Angel Wings are available with a touching friendship poem. 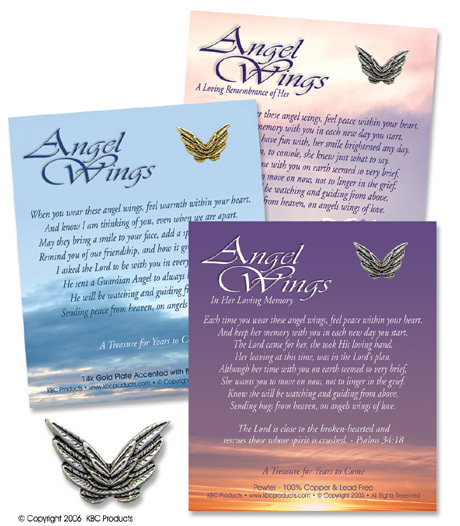 Our Angel Wings are also available with poems for male, female, boy and girl "A Loving Remembrance." These wings make a caring gift for someone who has lost a loved one. 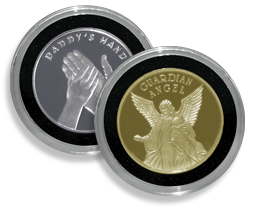 Let someone know you are thinking of them with our Guardian Angel Pin, made of 100% copper and lead free pewter. We also offer sterling silver Pocket Crosses and Keepsake Friendship Rings. Browse our Jewelry page for details and pictures. For a sharper picture, click on the picture for a larger view. If you would like to hear the poetry, please call us at 1-800-768-2197. We have a large variety of 8 X 10 frames to choose from in metal and wood. A Parent's Prayer For Their Daughter and A Parent's Prayer For Their Son are the perfect gift for the bride and groom given by the parents of the bride and groom. We have five poem choices for 25th, 40th, 50th and No Year Anniversaries. They include a poem from wife to husband, husband to wife, child to parents, children to parents, and friend or friends to couple. If you would prefer the poetry for some of our gifts but not necessarily the product, many of our poems are repeated in our 8 x 10 matted and framed prints or may be purchased as a print and mat only. They cover a wide range of topics for every age. For a sharper picture, click on the picture for a larger view. If you would like to hear the poetry, please call us at 1-800-768-2197. 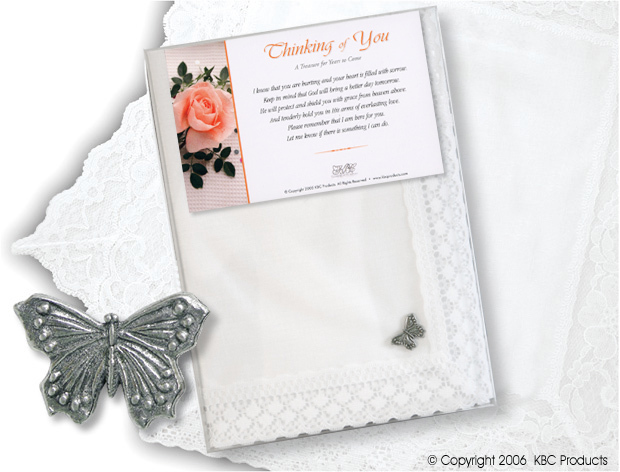 When you are at a loss for words, let our gifts help you convey your sorrow to a friend or loved one. These times are difficult to know just what to say. Angel Wings are available for a female, male, boy or girl. Another popular choice is our frame entitled "If Only I Could." For a sharper picture, click on the picture for a larger view. After browsing the site, if you would like to hear the poetry, please call us at 1-800-768-2197. KBC Products is a wholesale manufacturer of infant, children, wedding accessories and gifts. 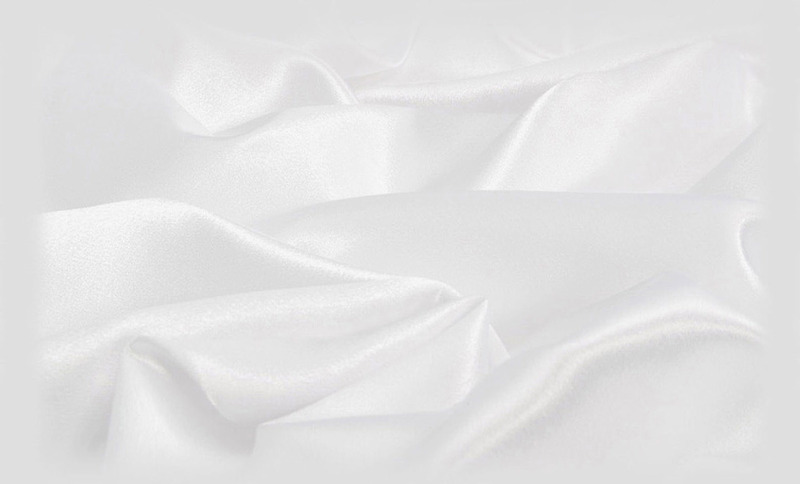 Each quality heirloom gift is accompanied by sentimental poetry. We are a family owned and operated business in Greenacres, Washington. Many of our products are home sewn by our talented seamstresses. Our products are distributed to retail stores nationwide and in Canada. The retail stores that carry our lines include gift stores, children's boutiques and Christian book stores. 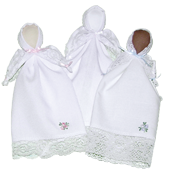 Our products are also carried in hospital and floral gift shops. Many of our gifts are sold through independent sales catalogs.